Any time someone proposes changes in the patent system, they can expect to encounter platitudes about how important the protection of "intellectual property" (a term invented in the 1970's) is to innovation and prosperity. Just about everyone involved in the system seems to accept the notion that patents are important in promoting technological progress and thus economic growth. For example, in testimony to the US Congress last year, former USPTO director David Kappos, referring to patent reforms, said "…we are reworking the greatest innovation engine the world has ever known." But people believe a lot of things that aren't true. Is this one of them? It turns out that, courtesy mostly of the Federal courts with just a bit of help from Congress, the United States has performed a lovely experiment in the last five decades that conclusively demonstrates that patents do not play a role in promoting the overall economy. Let's take a look. The figure below shows the number of patents granted per year, from the early 1960's until last year. 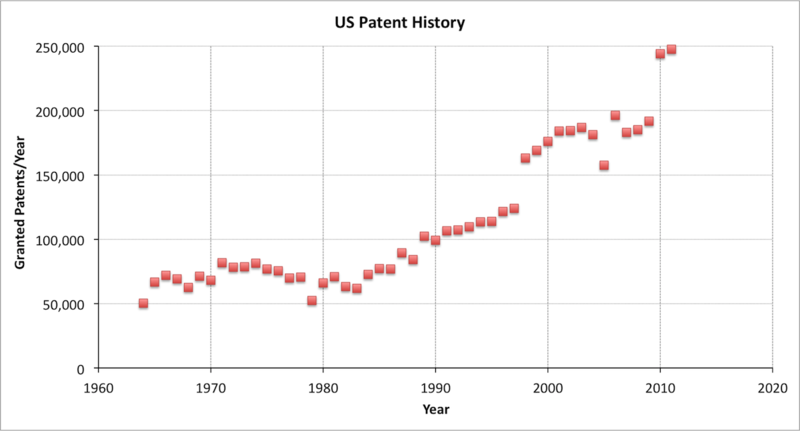 We can immediately see that the number of patents granted per year was about constant for quite a long time, from roughly 1962 to 1982, but then increased dramatically (and is still going up). By the end of the period, about four times as many patents were being granted per year as at the beginning. If patents are important for economic growth, we would expect to see some sort of secular increase in growth corresponding to this massive change in patenting. And on the contrary, if patents are detrimental to growth, we'd expect to see growth decrease starting around the 1980's. Naturally, we wouldn't be surprised if the response to this change was delayed a bit, as the effects of patent grants might take a while to percolate through the system. However, the changes can't be delayed by more than the 17- or 20-year term of a patent, and it's been more than 20 years since the changes started. This is as nice an experiment as you get to do in the social sciences, so whatever result we get has to be considered as authoritative. In the next graph, we show the United States gross domestic product, corrected for inflation into 2009 dollars, as red dots. The blue line is a very simple model for the data, which assumes a constant annual growth of 3.42% per year. 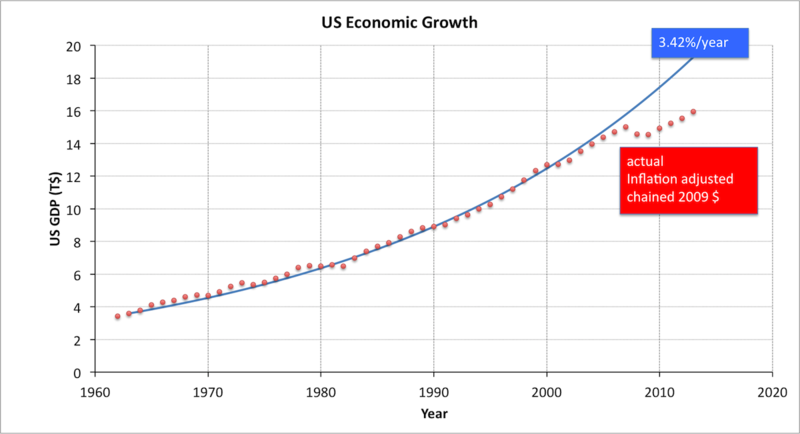 You can see that the blue line fits the measured data very precisely until 2007: that is, the US economy grew at a very constant 3.4% annual rate from 1963 to 2007. For those who enjoy statistics, the correlation coefficient between the measured data and this simple model, excluding 2007 through 2013, is 99.8%. That's pretty danged good even for the physical sciences. There is no evidence whatsoever for a sustained increase in growth some time after 1982, which would correspond to the hypothesis that patents benefit innovation and growth. In this context, a constant growth rate becomes a straight line on a logarithmic plot. 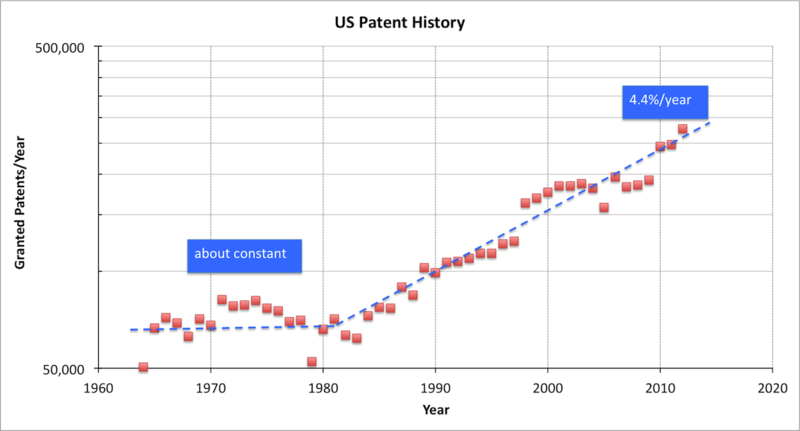 In the next graph, we can easily see that patenting growth has been a roughly constant 4.4% per year after about 1980. The final image shows US GDP again plotted logarithmically. It's readily apparent that the GDP data lies almost perfectly on the straight line of constant 3.4% annual growth, until the Great Recession. (And it's scarily clear that the slope of the line is now lower than it has been in the past five decades.) It's even easier to see that there is no correlation between patenting and GDP. We could double the system again, or get rid of it altogether, and expect no significant effect on overall prosperity in the United States. US patents do not play a measurable role in overall economic growth. Now, it's worth noting that there is an abrupt decrease in GDP in the Great Recession of 2007, followed by what appears to be a secular decrease in sustained economic growth thereafter, to about 2.3% per year. It's hard even for the most dedicated opponent of the patent system to blame a sudden event in 2007 on a trend starting in 1981. But one could also argue that the sudden deflection in 2007-2008 must not be real, but must reflect a discrepancy between "real" economic growth and recorded GDP, so that growth may have slowed substantially earlier than shown. 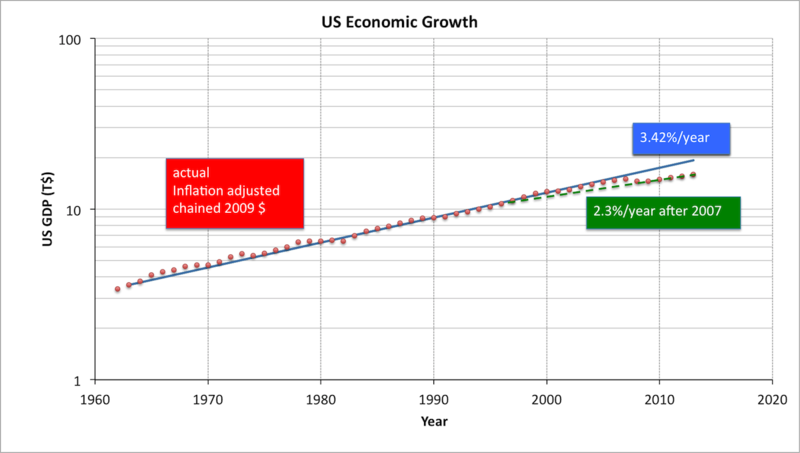 A possible version of this idea is depicted by the dotted green line, which illustrates the hypothesis that growth slowed to 2.3% per year around 1998, but the change was not observed by the means used to measure GDP until 2007. If we were to accept this hypothesis as real, we see the change in growth started in the late 90's, about 15 years after the change in the patent system - at the outer edge of plausible time delays. Even if US economic growth slowed a while ago, it's hard to claim the event was correlated with a change in the patent system occurring much earlier. We can't really assert that patents hurt the US economy, only that they don't help it. In the next post we'll establish a more dramatic correlation demonstrating the real effects of patent monopolies. In the next post we'll examine what patents are correlated with, and therefore what their real role in society probably is.